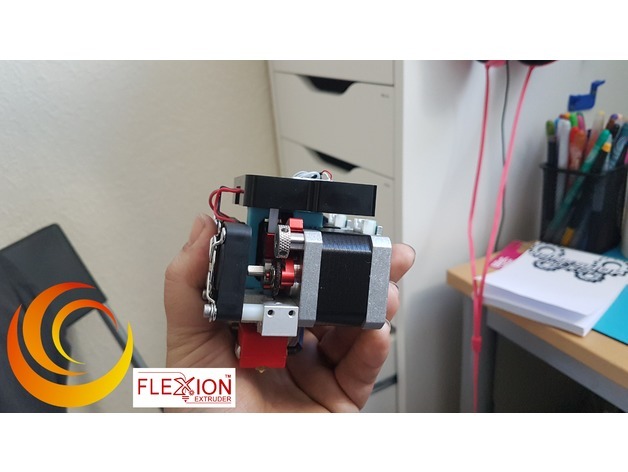 Now you can print Ninjaflex and X-60 Filament on your Flashforge Dreamer with the Flexion Extruder! Make sure you carefully label any wires and screws that you remove. Remove dual extruders from carriage by following the directions in the video below. Install the Flexion Extruder by following these instructions (mostly). The instructions are for the Flashforge Creator Pro printer, which is a very similar setup except the Dreamer has a Top Plate that contains a PCB board for the Heater Cartridge and the Thermal Sensor to plug into whereas the Creator Pro has these attached directly to the wire bundle that goes to the back of the printer. Follow the instructions in the video until you get to 13.20. The only difference is that you won’t have a bundle of wires (including Thermal Sensor and Heater Cartridge wires) that attaches to your printer. Make sure the hot ends are orientated the correct way. Print and install this bracket to hold the upper circuit board housing in place: http://www.thingiverse.com/thing:2169740 Thanks Teljemo! The new heater block is oriented with the 2 hot end holes closer to the front. Install the stock fan mount in the Left hand side of the heater block. Align the top plate so that the 2 PTFE guide tubes go through the filament feeder holes and that the wires for the Heater Cartridge and Thermal Sensor go up between the stepper motors and through the square hole. Install the upper PCB housing with the bracket that you printed, the 2x M3x10 socket head cap screws, and the 2x M3x8 flat head screws. Insert the wires from the Heater Cartridges and the Thermal Sensors to the correct connectors (Left heater block wires go to left hand side of the PCB, and the Red wire from the Thermal Sensor goes at the back). Plug in the 2 fan wires in their connectors. If you are unsure, go back to the video above for reference. Put the dual extruders back on the carriage. Screw in the 2 screws that hold it in place (underneath the carriage). Reconnect all the plugs from the wire bundle to their respective connectors (hopefully you labelled them all). Screw in the fan and turbo fan shroud. Your new Flexion Extruders are ready. Very interesting. I have a Dremel 3D20, which is essentially FlashForge. Will the extruder for the FlashForge work on my Dremel. Probably. I will email you separately. Just installing on a dreamer now, Does Anyone know if this drive alters the steps/mm for extrusion? Would this upgrade also fit on a Flashforge Finder? I’m looking for a wider range of support for printing materials..
I’m afraid not. I’m sure it is possible with some amount of effort, but nobody has done it yet.